There was an earthquake in Christchurch, New Zealand a couple weeks ago. I was really blown away by the amount of destruction, but, being low on funds, I figured there wasn’t much I could do. Then it occurred to me: people want me to sell my crochet critters all the time. So, I figured, if I sold a couple, I could then donate some money to the Red Cross, which is my favorite charity. Rather than selling something random, I scoured the internet for this specific pattern. I later found out that a lot of people don’t know what it is. So here is your chance to learn about the Kiwi. 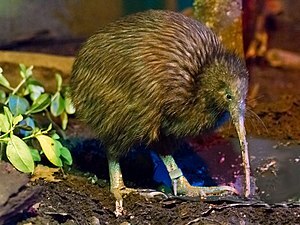 Kiwi are flightless birds that are native to New Zealand. The kiwi is the national symbol of New Zealand, and if you’ve ever known anyone from there, you’ll know they call themselves Kiwis. That’s because of the bird, not the fruit. Of course, now that you know what a kiwi looks like, you know why they named the fruit. 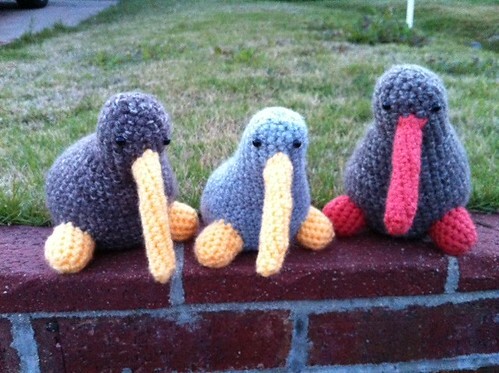 So, I made three kiwis that I am going to “sell” so that the proceeds will go to the Red Cross. This is where YOU come in. Rather than get money, and then turn it back around, I decided it would work best to have you donate the money yourself. (This way, you get your donation receipt for your tax records!) Because I really want this money to do some big things, the minimum donation is $20. For more information about the Kiwis and how to become the lucky owner, keep reading.